“HOUSING Solutions 2017 & Beyond,” an exhibition of the Central Housing and Planning Authority (CH&PA) geared at creating a “cohesive community” in Perseverance, East Bank Demerara, was launched on Friday. Despite inclement weather conditions, Ministers of Government, CH&PA officials, members of the private sector, and ranks of the Guyana Defence Force among others gathered at Perseverance to witness the much-anticipated exhibition. Billed for May 26-28, the expo is set to have on display 10 low-income, five moderate and eight middle-income houses as well as six duplexes and two single units, built by the CH&PA and private contractors. These include duplexes of three designs and flat houses on stilts Minister within the Ministry of Communities with responsibility for Housing, Valerie Adams-Patterson told those gathered at the launch that the initiative is a step in the path to create a “cohesive community” in Perseverance. The area, she said, was strategically chosen because the layout is set to accommodate 570 houselots, some of which will help with reducing the 25,000 housing applications’ backlog within the CH&PA system. Some 200 houses have already been built in the area and the houses that will be on display at the expo will add to the community. At the end of festivities, the houses will be sold. “What we are actually creating here is a model village. In this model village, none of the potential owners, those who will buy can modify the houses until after five years,” said the minister. Aside from being a model village, the area has the potential for the development of reserve sites, community facilities and other features that will constitute a “cohesive and sustainable” community. 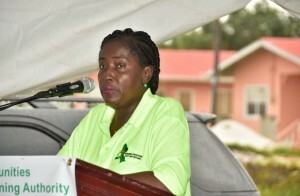 The ministry’s move to promote such an initiative comes as an effort to improve the housing-delivery system in the country, by pursuing a range of settlement developments which include the construction of various housing solutions for low and moderate-income houses for all Guyanese. “This will be done through a partnership with private sector and civil society, so that we will have an integrated and comprehensive approach to the regularisation of squatting areas,” said Minister Patterson. CH&PA Chief Executive Officer (CEO) Lelon Saul echoed the minister’s sentiments, noting that their aim is to provide adequate housing to all by making major investments in the housing sector, developing green spaces and promoting squatter relocation. Jordan said investment is key to development and is ready to make representation to Cabinet for the provision of incentives to certain investors. “I am prepared to recommend to Cabinet that we give additional incentives to those private sector individuals and entities who wish to get involved in areas such as clay brick manufacturing and the production of pre-fab houses for the local and overseas markets… representation must also be made by [the] private sector for relief in the lumber sector,” said the minister. These steps, Jordan said, are necessary, because housing supplies in Guyana have not kept pace with demand. The accumulated housing supply shortfall is due to a number of factors, some of which are of a long-term nature, said Jordan. It was pointed out that there have been restrictions on land available for housing. And, Jordan explained, that with the high non-performing portfolios of many commercial banks, the availability of credit for housing may be further squeezed. Solving this critical situation is a big challenge for Government, given the high cost of construction materials and other related expenses. In addition, homes without supporting infrastructure such as water, proper sewerage system, electricity and social services fail to achieve desired benefits. Affordable housing therefore is a “herculean and multi-faceted” objective for which practical solutions are needed, the finance minister said. “The expo however represents the roll-out of our programme to reverse the depressed state of the real estate sector in Guyana. The country continues to experience acute problems of affordable housing and to deal with this there is need for higher investment, both private and public,” finance minister said. Jordan pointed out that renewed construction and development is a worthwhile boost to overall growth in the economy, as well as creating employment and added value in the construction and other industries. “I am calling for a radical, new approach to renew the quality and availability of social housing in Guyana. By investing in social housing, our Government will help to create a basis for social housing renewal and bring jobs, skills and regeneration to our communities,” he said.